Home Main Dish Chicken EVEN THE FATHER OF FAT PHOBIA SAID YOU SHOULD EAT THIS ONCE A WEEK! Organ meats are a vital part of most traditional diets. A trip to an ethnic grocery or foreign marketplace (Chinese, Japanese, Mexican, French—anywhere but here) will let you see how important organ meats are in the diets of most societies. (The Silver Spoon, the Bible of Italian cooking, devotes 28 pages to variety meats.) Liver heads the list of nutrient dense foods, but it is also one that most Americans never eat. It can be bitter, dry, and tough, but when cooked properly, it is moist, tender, and delicious as well as nutritious. meal, including yours truly!). Now the spare bits are normally removed before it reaches the shelf. Alas, liver has become almost as scarce as hens’s teeth. This Fall, I discovered that there is an abundant supply of fresh turkey livers around Thanksgiving and it is super cheap. The stash in the top picture cost me $1.99 per pound! The butcher at my local Whole Foods told me they usually have it starting on November 15th. I stocked my freezer with what I thought would be enough to last for months, but I find it is going much too quickly because we love it so much! “The Fat of the Land,” Time Magazine, January 13, 1961, Vol. LXXVII No.3. Exact measurements are not crucial to the recipe. I only needed them as a basis for figuring the nutrition data. Separate liver lobes and remove connective tissue. Slice each lobe into 2 or 3 slices depending on size. Place liver in a bowl and cover with kefir or yogurt, thinned with water if necessary to the consistency of cream, or use any kind of milk. Let soak 20 minutes to remove bitterness. Cut onion in half around the equator then slice pole to pole into 1/2-inch slices. Drain liver and blot dry on paper towels to prevent splattering. Discard kefir or yogurt. Heat pan over medium-high heat until hot but not smoking. Sauté liver on one side until brown; turn over and brown second side, about four minutes total. Remove pan from heat, cover with a lid, and let sit for a few minutes until it is evenly pink inside. Do not over-cook! 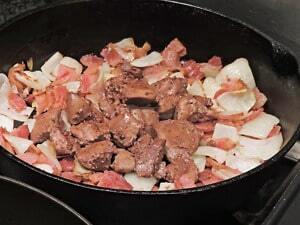 Spoon liver over bacon and onions and serve hot. *You can use chicken liver for this recipe, but I like turkey better. The lobes are bigger so they make nicer slices and there is less connective tissue. Bacon, How to cook liver, Liver. Bookmark.